It is well-known to any self-respecting Wisconsin beer-lover that Kirby Nelson of Capital Brewing is the local (in not national) king of doppelbocks. From Blonde to Autumnal Fire to the once-a-half-decade top dog, Eisphyre. As Capital has branched out from its German roots (with debatable results), some old friends have been left by the wayside (Dark Doppelbock and Weizenbock among them). The Dark was one of my favorites as I got into the rich German style and I was certainly sad to see it discontinued. Needless to say, I was pleased when I took my first sip of Imperial Doppelbock (Codename: Barbara – Kirby’s wife’s name) only to recognize a lot of Dark’s smooth character. 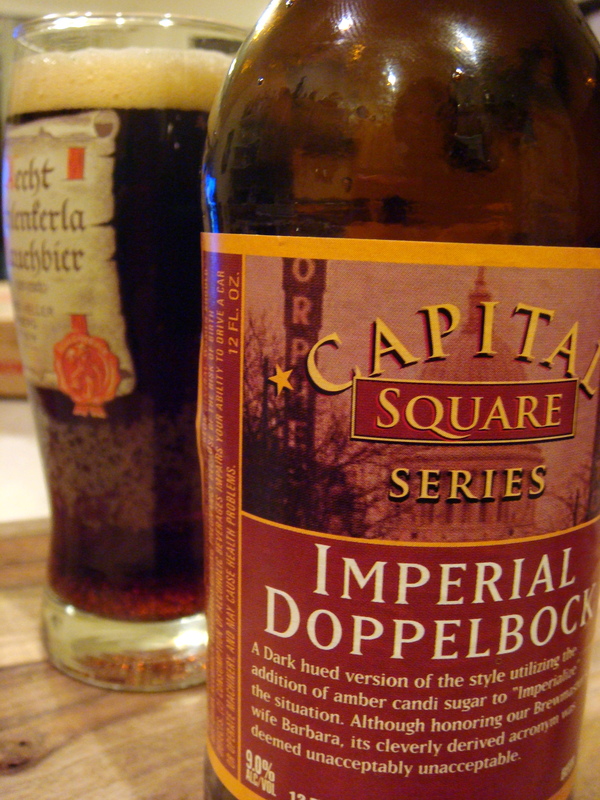 I must say, the idea of an Imperial-Double-Bock (does that make it a quadruple bock?) seems comically extreme, even in today’s age of imperialized everything in the craft beer world. This beer came out in bottles around the holidays (after a few test batches reached local tap lines last year), so it isn’t brand new, but should still be kicking around some area shelves. My take: pours a deep, translucent mahogany in the glass under a finger of caramel-tinged foamy head. Nose is full of molasses, caramel, biscuit and dark fruits. Raisin and candied dates star on the palate with caramelized sugar and molases adding body without feeling cloying. Mouthfeel is velvety smooth and left slightly coated after each sip though the overall impression is biscuity and dry. An impressively rich-yet-smooth doppelbock that manages its 9.0% heft with grace and elegance – traits I’m sure the brewer had in mind when naming it after his better half. Long live the king of doppelbocks.